Every Tuesday one of the funniest dogs on the Internet, Kolchak the Puggle, shares some of his favourite treats and recipes. This series is such a hit, he has turned it into a blog hop so we can all share some of our dogs’ yummiest snacks. Baking has been a hobby of mine for a long time. Once I discovered I could bake for my dog, I loved it even more. Shiva doesn’t care if the cheesecake doesn’t set or if the crust has turned to charcoal. No matter what I make for her, she gobbles it up as fast as she can. By far she is the best food critic ever. I’ve shared this recipe before. As it’s my favourite and super-easy to make, I figured I may as well share it again. I attribute these treats with a lot of our training accomplishments. The batch I made this past weekend before the fun match served us very well. The stinkier, the better as far as my dog is concerned. Looks pretty tempting, doesn’t it? I bet your stomach is growling now. 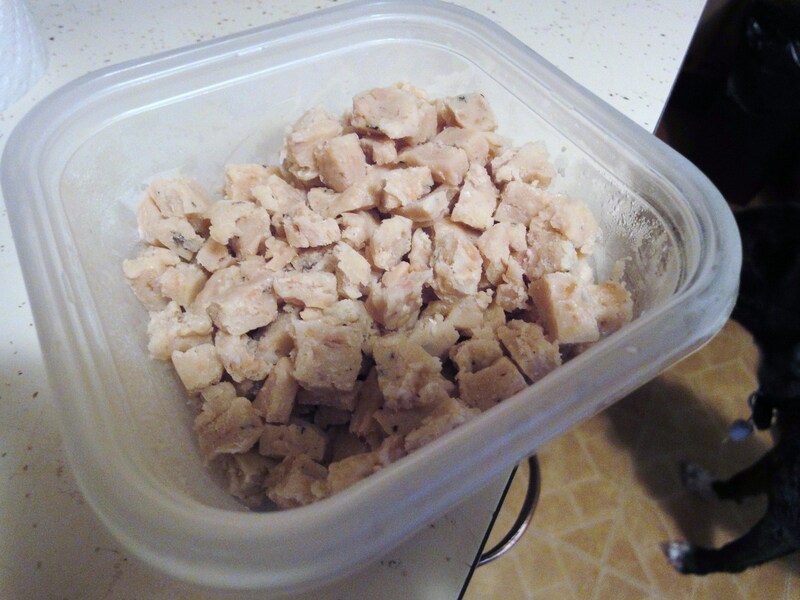 2 cans of tuna (do not drain) or 15 oz can of salmon un-drained – I have also used canned chicken and turkey. Basically any meat in a can will do. What I love the most is that you can cut the fudge into teeny tiny pieces. They smoosh and tear easily and thus are perfect for training. Once cut up, the pieces freeze very well. Depending on how often you train, one batch can last for a few months. Or, for one agility match. Find some more tasty snack ideas by checking out the blog hop. Do you have any fun recipes you enjoy making for your pets? Does your dog have a favourite treat she thinks everyone else should know about? I’d love to hear them all! And thank you for doing that, Sugar! I’m sorry I forgot to include your name. Your blog is terrific and the tasty hop was such a fun idea! Will definitely make some of those! They are so easy, that’s the genius of it all. They don’t taste like much, pretty bland, but dogs seem to like them. We were quite a hit with some other dogs on Sunday and Shiva ended up sharing! I am so glad your dogs liked them as much as Shiva. I have some other recipes as well but I love the simplicity factor. You don’t even need specific ingredients or equipment. I even use a larger pan than 9X9. Baking for dogs is much more flexible than baking for humans. Wow that looks super easy! I will try that with my pups. I love to bake but haven’t ventured too far with baking for the pups. You’ve got me thinking now! Those look so easy and I bet they would be a HUGE hit over here.Kol & Fe love anything that is really, really stinky. Thanks for joining us on our Tasty Tuesday Blog Hop! Hop On! Thanks for putting it all together. It was a cool idea! You can tell your mom that other than the smell, these treats are totally people-friendly. Much cheaper than the store-bought versions too. LOL. They aren’t that bad. But I may just be way too used to disgisting dog treats at this point. They are less gross than tripe! Uh, sorry. I’m getting kinda drooly here. I have GOT to get my mom to make me some of these. It looks super easy so I bet she could prolly handle it. Okay, I gotta go get a towel to clean off my keyboard cuz it’s kinda wet now. I love all you youngsters who cook for your dogs. I don’t cook for my KIDS anymore. After so many years, I’VE BURNED OUT. But I have to admit, the dog would show more gratitude. Hahahaha! I don’t cook for my PH either. I don’t cook period. Unless it’s for the dog. What does that say about me? I don’t want to know. It’s all about the disgusting smell. If you want to break through the haze that is Shiva on an agility course, you have to bring out the good stuff. Even hot dogs aren’t enough. I agree.. the stinkier the better 🙂 thanks for sharing the wonderful recipe 🙂 We might just try this since Dom has become a very picky eater lately. Our love to dear Shiva. That’s tough. 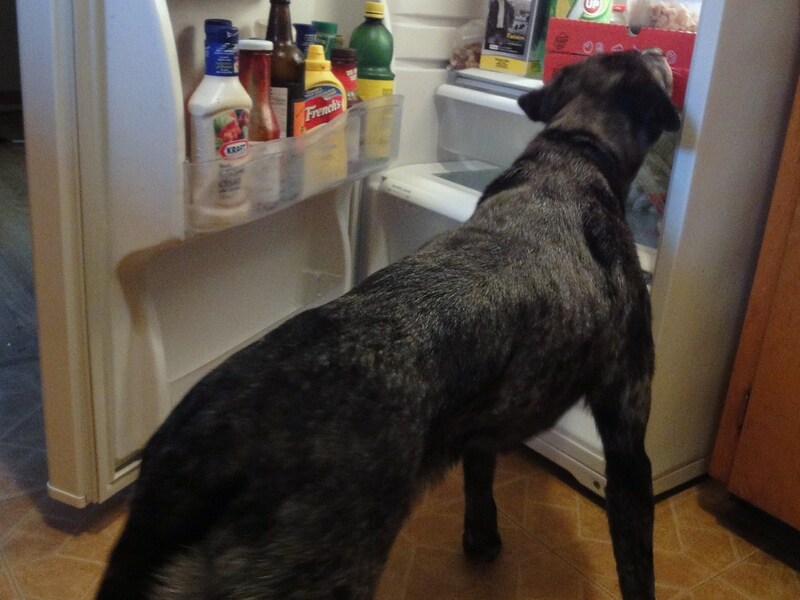 I don’t know how I’d deal with a picky dog. One of the reasons Shiva has been fun to train is her willingness to work for crumbs. You definitely have a challenge on your hands. I hope this can help. Blueberries are awesome dog treats. I often put them in her Kong. There are a few good dog cookbooks out there if you are interested. You are a very good dog mom too, whether you make homemade treats or not. I doubt Cali knows the difference, after all! I made these a while ago and used them for Barbie’s CGC training, especially the more difficult things for her like recall and ‘meeting a friendly stranger’. They are firmer and better than the dog-polony rolls that I was using before that. I also like to make my dogs peanut butter & oat cookies. Will be cooking up some doggie treats on the weekend if I have time! I am a horrible cook for people, I wonder if I’ll have better success as a cook for dogs. I’m definitely going to have to try your recipe! hello great site,thank you so much for you great idea ! !wonderful i am gonna try with my dog ! I love to bake but haven’t ventured too far with baking for the pups. And thank you for doing that, Sugar! I even use a larger pan than 9X9. After so many years, I’VE BURNED OUT. They don’t taste like much, pretty bland, but dogs seem to like them. Golden Hello. They are less gross than tripe! That’s tough. Mum said i could come on and thank you for that yummy recipe.